Growing up, it appears my hair was always one long experiment of how much processing it could take. We had done home perms, hair color and haircuts until I was a teenager. Then I decided I should see a professional. But being young and impulsive, I did not have just one stylist, I had three. And they all worked at different salons. Even with seeing them, my hair still took a beating because they never knew my full hair history. So here are a few things I’ve learned along the way to help you when making decisions regarding your hair. They will educate you on how to achieve the optimal style but also on how to maintain your hairs’ integrity. The health of your hair should be most important. Every time the same person does your hair, it will get better and better. We learn the quirks in your hair with each cut and perfect the style to your hair texture and face shape. If you have stubborn grays we can kick up the coverage as needed. However, not all stylists share what formulation was used. Seeing a new stylist (even in the same salon) could mean starting at the beginning again. Professional stylists always continue their education and stay up to date with the latest trends to keep your hair looking fresh. A professional will take into consideration the level maintenance you are willing to do every day, the type of profession you have and also what your personal life is like. 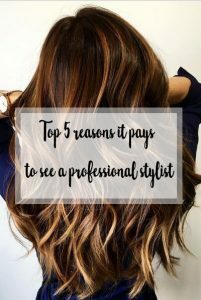 While we stand there and ask you these personal questions we are actually looking for clues as to what will work for your hair in your life as a whole. Here at Silvana’s we have a fantastic product called Olaplex that can repair damaged hair or maintain the health of the hair while pushing boundaries of color. We make sure to take the time to have a thorough consultation with you. We make sure we understand your concerns and what your hair desires are. I personally like to add a 15 minute slot so I know I have the time it will take to make sure I understand you. We are required to take at least 3 classes a year to stay up to date with the trends. Not only does it keep the stylists current it also helps inspire new ideas within the salon. Our job is to serve you and to make you feeling your best when you walk out the door.